Heat exploded across Oklahoma during July thanks to a rapidly intensifying drought and a persistent upper-level ridge of high pressure. The combination of dry soils, wilting vegetation and a brutal summer sun led to the sixth warmest July on record for the state. Those records date back to 1895. According to preliminary data from the Oklahoma Mesonet, the statewide average temperature finished at 85.9 degrees, 4.3 degrees above normal. July becomes the 23rd month out of the last 28 to finish warmer than normal, a persistent signal that began in April 2010. The first two months of summer were the ninth warmest on record at 3.2 degrees above normal. The January-July statewide average of 63.9 degrees was easily the warmest on record for the first seven months of the year at 4.8 degrees above normal. The heat broke or tied four daily records during the month at Oklahoma City and twice at Tulsa, including that city’s all-time high minimum temperature. Tulsa’s temperature only dropped to 88 degrees on July 30, breaking the previous all-time record high minimum temperature of 87 degrees set on August 2, 2011, and July 16, 1980. The highest temperature recorded during the month was 112 degrees on July 31 at several locations. The century mark was reached at all 120 Mesonet stations on both July 29 and July 31. The month was also the 15th driest July on record with a statewide average rainfall total of 1.11 inches, 1.63 inches below normal. 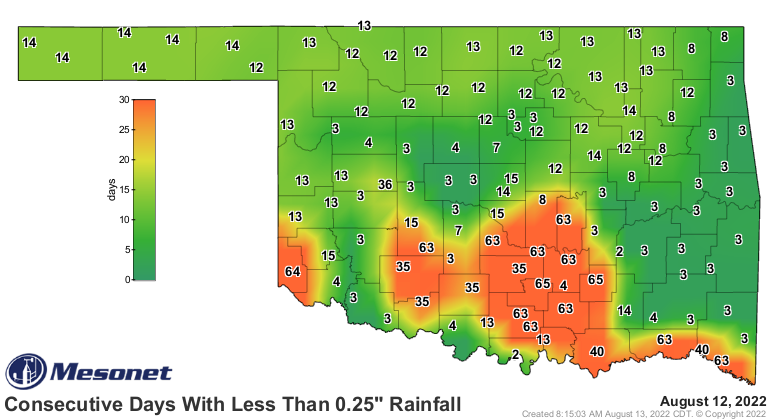 The moisture deficit during July continued a dry streak that began in April and intensified during May, encompassing the bulk of Oklahoma’s primary rainy season. The May-July statewide average rainfall total of 5.99 inches fell 6.25 inches below normal and ranked as the third driest such period on record. Three of the 120 Oklahoma Mesonet stations – Marshall, Spencer and Waurika – recorded no rainfall for the month of July and 10 recorded less than a tenth of an inch. Idabel led the state with 5.75 inches. 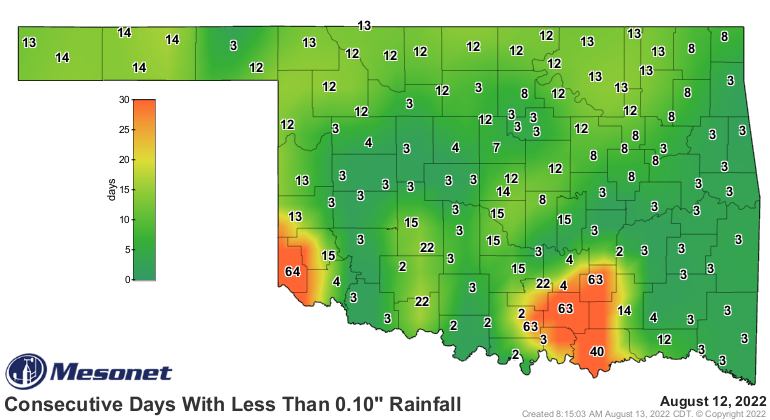 July 31 marked the 55th day since the Mesonet stations at both Norman and Watonga recorded more than a tenth of an inch of rain in a single calendar day. The drought’s impacts became more significant as the month progressed. The USDA rated the moisture levels of 96 percent of the state’s topsoils and subsoils as either “poor” or “very poor” in a report released on July 30. That report also rated 64 percent of the state’s pastures and rangelands as being in either “poor” or “very poor” condition. County-level USDA offices from across the state reported a rapid deterioration of crops and vegetation as well as diminishing stock ponds. The lush green growth of the state’s warm and wet early spring was transformed into abundant fuel for wildfires as it became dormant or dead. Many large fires were reported during the latter half of the month. The latest U.S. Drought Monitor report indicated severe to extreme drought had crept into the state from both the east and the west, with 64 percent of Oklahoma now portrayed in at least severe drought. That is the highest such level since Nov. 22, 2011, when the drought had just begun to diminish following its zenith in October. Approximately 15 percent of the state is considered in the extreme drought category, the highest percentage since early March when the drought appeared headed towards extinction. The Drought Monitor’s intensity scale slides from moderate-severe-extreme-exceptional, with exceptional being the worst category. The latest temperature and rainfall outlooks from the National Weather Service’s Climate Prediction Center are less than optimistic for widespread relief. Increased odds of both below normal rainfall and above normal temperatures will continue for August. The August-October temperature outlook also indicates increased odds of above normal temperatures. August would not be considered the ideal month for relief regardless of those outlooks as the state’s driest summer month and the calendar’s second-hottest, next to July. Relief from summer normally begins to arrive during September as the jet stream begins to meander back towards the south once again, bringing cooler air and increased chances of rainfall. Link to map of the "Consecutive days with less than 0.10 inches of rainfall"
Link to map of the "Consecutive days with less than 0.25 inches of rainfall"